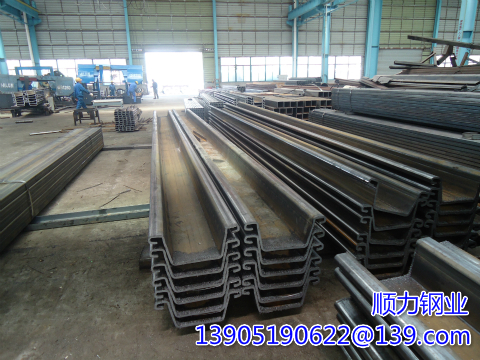 Steel sheet piles retaining structure must be able to work in two types of special conditions are a class of normal use conditions, these two conditions represent the bearing: one is the use of the process can think of the worst conditions also load limit state and Normal Use limit state. The ultimate state of bearing capacity should consider the overall stability of the structure, including the mechanical properties of the soil, structural failure, excessive wall deformation and soil changes on the adjacent structure. The failure mode of the structure includes moving or rotating. The stability of the retaining wall depends on the mobilization of the earth pressure. The earth pressure can only be fully mobilized when the structure fails quickly, at this time the ultimate state of bearing capacity. Compared with the soil deformation under the normal use limit state, the soil deformation is much larger when the earth pressure is fully mobilized. We use the soil deformation and soil movement, must ensure that both will not exceed the allowable range. Because the force acting on the retaining wall of the steel sheet piles and the force in the soil body are inversely proportional to the deformation of the wall, the deformation under normal use limit state is the control standard of the wall balance. Of wall deformation can not be enjoyed, it is possible to achieve the normal use limit state by controlling the degree of earth pressure transfer. The actual design, usually the introduction of a safety factor. Lack of experience of designers of overlooked preparatory work for the design, that is, what type of steel piling need to pile more difficult places are usually high-strength steel sheet piles, so you can set up one or more less support, The workload.